I'm the kind of person who needs coffee to clear the fog from my brain in the morning. It just gives me the boost I need to get the household up and running and power through some morning work. 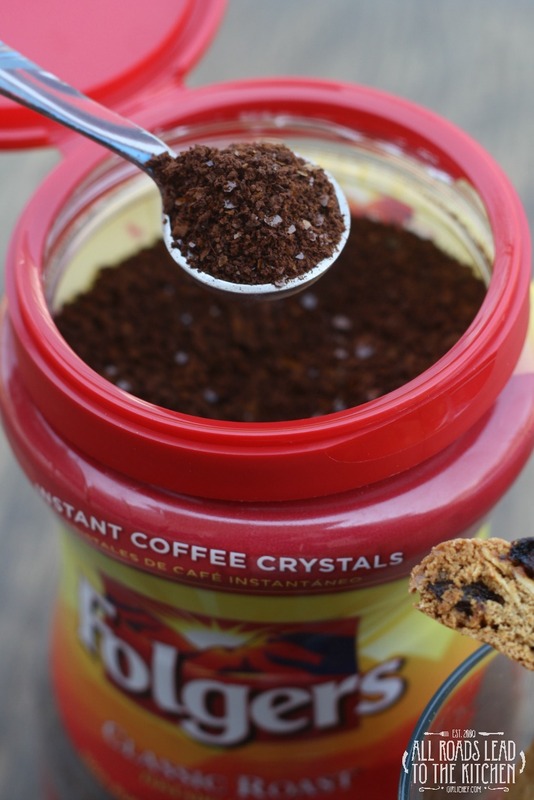 By the time early afternoon (aka break time) rolls around, my coffee pot has been cold for hours—that's when I open up the cupboard and reach for the instant coffee. I actually love this time of day, because it's my "me time"; a window of time between that busy morning and late afternoon when my husband and kids walk through the door after work and school. I use it to watch a movie, read a few chapters of a book, brainstorm recipe ideas, or just sit and listen to the world...more often than not with said cup of instant coffee and a snack. 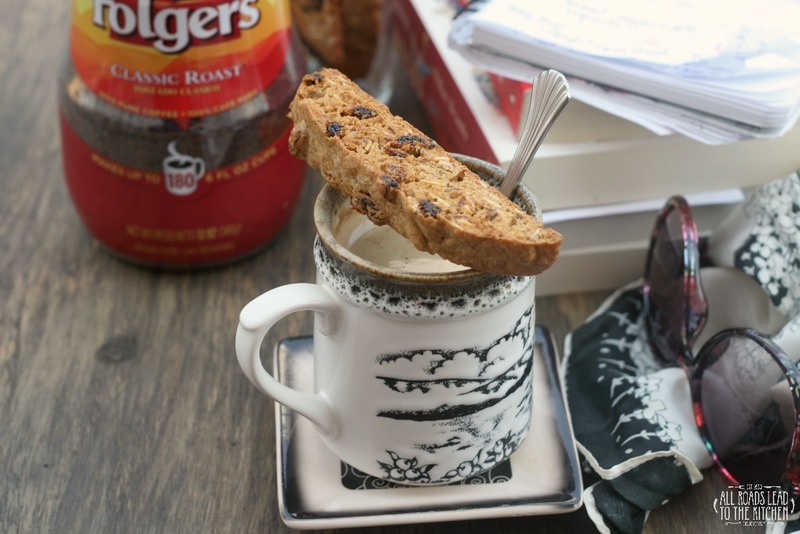 Bonus points if that snack has a little caffeine-kick of its own like these biscotti. 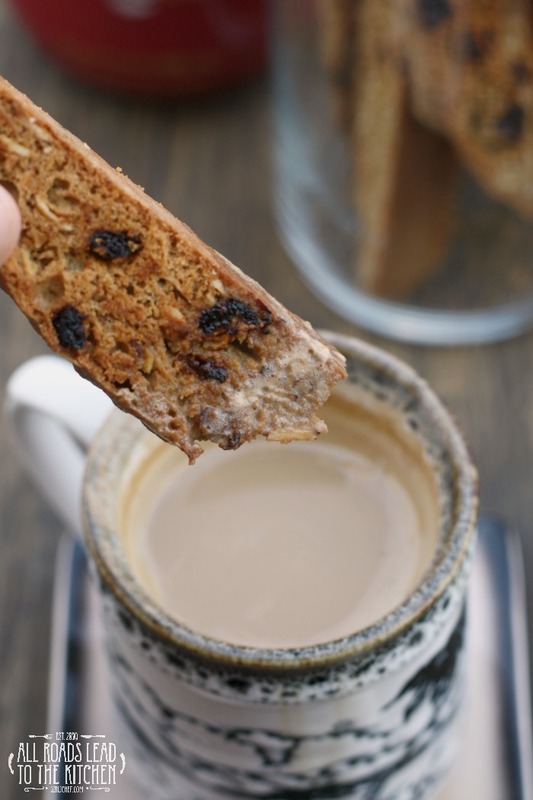 So yes, I do go for the gusto and dunk a biscotto into my coffee, but it would be perfectly acceptable to dunk it into a glass of milk. 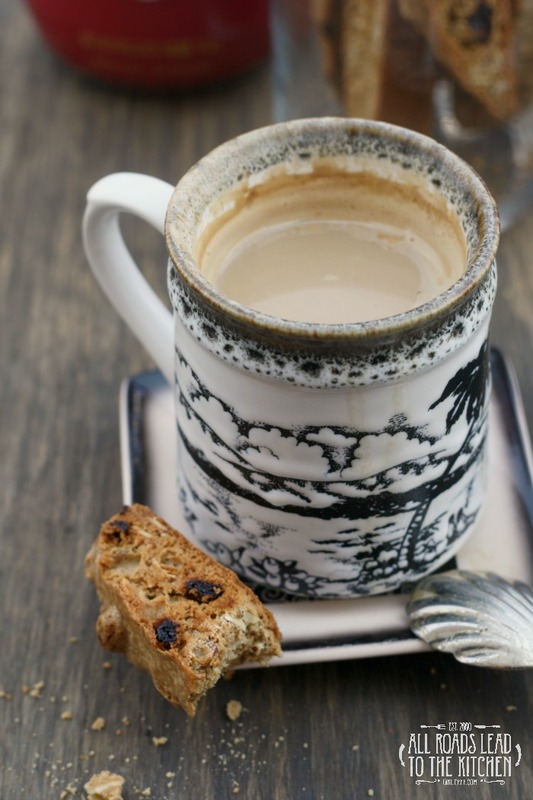 The crunch of these coffee-infused cookies, studded with slivers of almond and chewy bits of dried goji berries, can really make any moment into a "me moment" as you lose yourself in the process of eating them. They hungrily soak up the coffee when you dunk them, coaxing each bite into surrender. Although some days are so busy that I miss my window, I can really tell the difference in both productivity and spirit when I'm able to relax and recharge midway through my day. What about you? Do you have a certain time of day to yourself...a time that you use to power up your batteries and do something just for you? Crunchy "twice baked" cookies infused with a hint of coffee and studded with almonds and dried goji berries. Perfect for dunking! Preheat the oven to 350° F. Line a sheet pan with parchment paper and set aside. Beat the butter and sugar together until fluffy. Beat in the eggs, both extracts, and dissolved coffee. Add dry ingredients and beat until thoroughly combined. Gently fold in the almonds and goji berries. Divide the batter in half and use wet hands to shape each half into two long loaves, about 2-inches wide, setting them on the baking sheet with at least 2-inches in between the loaves. Slide into the oven and bake until golden, about 25-30 minutes. Slide the parchment (loaves and all) onto a wire rack and let cool for 10 minutes. One at a time, put the loaves on a cutting board and cut slices diagonally into 3/4-inch slices with a serrated knife. Set back onto the parchment-lined baking sheet, cut side down. Bake until golden, 25-30 minutes, flipping over halfway through cooking. Transfer to a wire rack and cool completely. 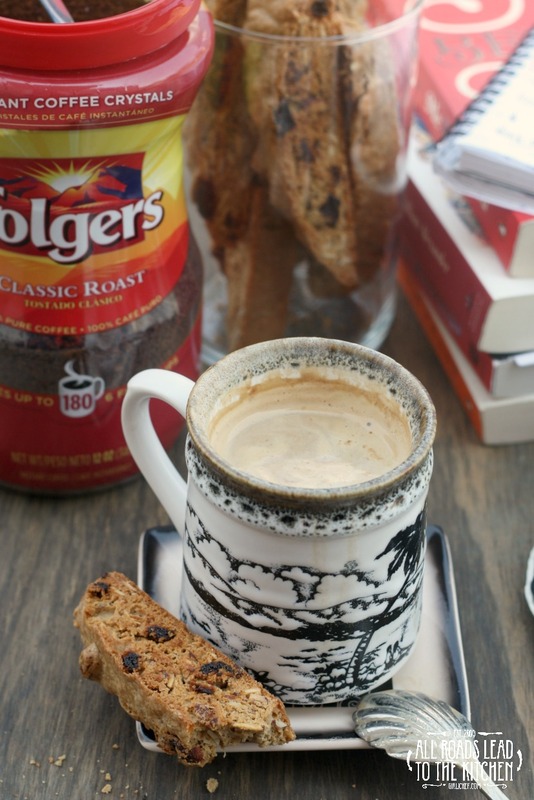 If you enjoy coffee as much as I do, be sure to check out these tempting Folgers Recipes!